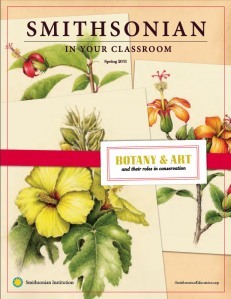 The latest issue of Smithsonian in Your Classroom produced by the Smithsonian Center for Education and Museum Studies and distributed to school districts across the country is titled Botany & Art and their role in conservation and is based on ASBA's Losing Paradise? exhibition. The magazine provides lesson plans that introduce students to plant conservation and take them through the process of creating their own botanical illustration. Students compare herbarium specimens, photographs, and artwork of six endangered plants all from Losing Paradise? Endangered Plants Here & Around the World.